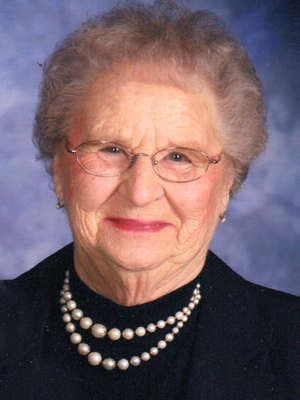 Irene L. Johnson, age 96, passed away peacefully on Wednesday, October 10, 2018, at Friendship Manor Health Care Center, in Shakopee, MN. She was a resident of Prior Lake, MN. A Celebration of Life Service will be held on Saturday, October 13 at 11 am, with a time of gathering from 9:30-10:45 am, at St Paul’s Lutheran Church 5634 Lutheran Road SE, Prior Lake. Pastor Mark Neumann will preside. Pall bearers will be Barry Stock, Stacy Zephirin, Jeff Monnens, Tom Johnson, Doug Johnson and Steve Klingberg. Interment will be on Monday, October 15, at 4 pm, at St. Paul’s Cemetery, Prior Lake. The life of Irene Loretta began in Appleton, MN on September 3, 1922. She was born the second of six children to Walter and Helen (Zager) Stock. Irene grew up on the family farm, along with her siblings, Bernice, Harry, Vera, Hank and Wally. She spent countless hours working side by side with her pa, milking cows, working in the fields and tending to the other daily chores. She attended school through the ninth grade, when she was called to stay home and assist on the farm. At the age of 17, Irene married a neighboring hired farm hand, named Floyd Johnson. They exchanged wedding vows on February 15, 1940. Irene and Floyd first settled in Appleton. He continued working as a farm hand and she focused raising their children, Arthur, Merle, Barbara and Kathy. They enjoyed camping in the travel trailer, fishing and spending time together. In later years, Irene and Floyd loved exploring the county side in their motorhome, especially to California to see their son, Merle. In 1953, Floyd came to Prior Lake and started the Prior Lake Cabinet Shop, along with building a home for his family. Irene worked for a short time at the Minneapolis Stock Market, where she was responsible for charting the stock prices on a large overhead chalkboard. Their daughter Kathy came along in 1956, a big surprise to all! As the cabinet business grew, Irene and Floyd worked side by side in the shop. In the late 1960’s, they moved to Brandon, MN. Here, Irene and Floyd owned and operated the Johnson’s Kamp Kappy Resort, on Devils Lake. It was a run-down resort, which they rebuilt. In 1979, Irene and Floyd sold the business and began another chapter in their life. They moved back to Prior Lake and then to Appleton in 1984, where they stayed until 2007, before returning to Prior Lake. Over the course of these years, they continued to work side by side remodeling homes and completing side jobs. Irene did everything fast and meticulous about every detail! She could whip up a quick delicious meal, bake the most amazing desserts and was unstoppable working in her flower gardens and mowing the lawn. Irene had a strong faith foundation and was always involved in church life. She and Floyd spend many hours volunteering at the Appleton Nursing Home and delivering Meals on Wheels. When Irene found time to relax, she found joy playing music, just like her mom and watching game shows, in her later years. The greatest passion in Irene’s life was being a devoted, caring and loving wife, mother and grandma to many generations. Life changed for her in March of 2011, when Floyd passed. But throughout all of life’s trials and tribulations, Irene remained strong willed, enjoyed life and had a good-natured personality. Irene will be forever loved and missed by son, Merle (Pat Barfield) Johnson, daughter, Kathy (Alan) Monnens; daughter-in-law, Barbara Johnson; son-in-law, Gene (Nancy) Klingberg; grandchildren, Molly (Barry) Mahowald, Douglas Johnson, Amy (Bob) Mahowald, Tommy (Tammy) Johnson, Scott (Diane) Johnson, Terry (Jeff) Rivers, Wendy Parsons, Michelle (Floyd) Cmela, Sherry (Bo) West, Steve (Tammy) Klingberg, Stacy (Tim) Zephirin, Jeff (Becky) Monnens: many great-grandchildren and great-great grandchildren: sister-in-law, Betty Stock; other relatives and friends. There to greet Irene home in heaven is her husband, Floyd; son, Arthur Johnson; daughter, Barbara Klingberg; daughter-in-law, Janet Johnson; parents; siblings, Bernice (Harold) Van Winkle, Harry Stock, Vera (Wayne) Rohloff, Hank (Lillie) Stock and Walter (Julie) Stock. I am so sorry about the loss of Irene. She was a wonderful woman. She was always so upbeat and friendly. She was very helpful to Joan when Joan moved to Keystone with her. I am so sorry I wasn’t here to be able to go to the wake or funeral. I will remember her and all of you in my thoughts and prayers.